What do these girls have in common? They never lost to a Foothill League Team this year! 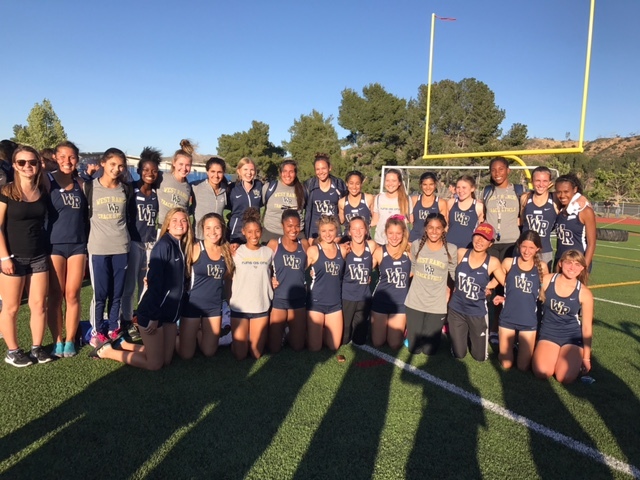 Congratulations to our girls Track and Field team who won Foothill League by beating previously undefeated Saugus 81-55. It was a total team effort and everyone really dug deep to secure the win for West Ranch. Some of the standouts included girls 4x100 relay, 4x400 relay, Sophia Hoelzel winning the 1600m, London Lewis winning the 400m, Bailey Pate winning the 200m, Adaugo Oguejiofor winning the high jump, Shelbi Schauble winning the long jump, Amber Racina winning the pole vault and Natalie Ramirez winning the discus and shot put. Many many great 2nd and 3rd place finishes as well. Not to be outdone by the girls, the boys posted a perfect season of their own going 0-5 for the season. Despite the disappointing season beset with injuries, there were some great performances at their last meet. Tyler Allen won the 400m, Justin Sherfey (Sophia's prom date) won the 1600m, Preston Pope won the 3200m and Mya Davis won both 100m and 300m hurdles. Great season Wildcats! Congratulations to Coach Sara and all her coaches! We're looking to tear it up in the post season! Good luck to all!